"The actual design of the Crossroads Circle was modified to protect the two American elms rather than have them removed, although they are within ten to twenty years of reaching their mature life expectancy. 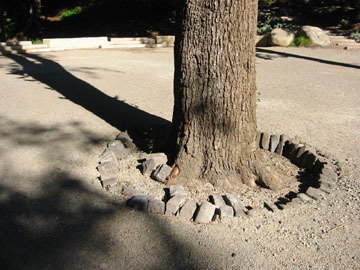 In addition, we have built tree wells lined with granite pavers to protect their root crowns." According to published literature elms commonly live 200 to 300 years. These were planted about 1920. Rec and Park Reforestation Staff recently filed a report on other elms in the park over 100 years old and these were given an expectance of another 100 years. 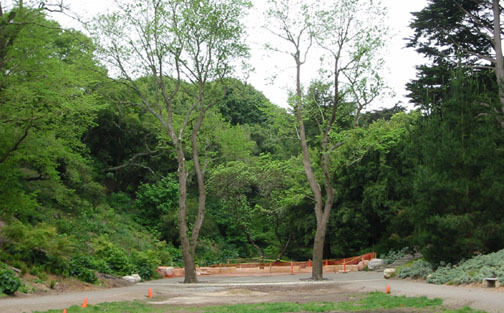 The "tree wells" are a direct contradiction of advice given by the current head arborist of the Recreation and Parks department as relates to these specific trees. The granite pavers are already scattering and damaging the root crowns of these trees. The current condition will most likely cause an early death to what should be a valuable asset to the Grove. But apparently they stand in the way of the statement this latest hardscape is to make.